This is a great circuit of problems somewhat off the beaten path – though definitely near a beaten path. Most of the boulders here are smaller and sport good problems for those afraid of highballs. A few cool air pockets make this area slightly cooler in the warmer months. 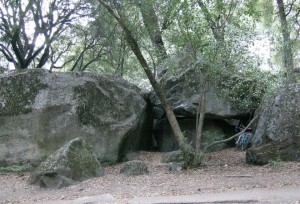 Which SuperTopo guidebooks cover Ahwahnee Boulders - East? Matt Wilder on The King (V7). Lyn Verinsky on Pinball Wizard (V6). Jason Kehl on The Moffit Start (V10). Lisa Davidson on The Angler (V3). Brittney Griffith on The Kor Problem (V3).